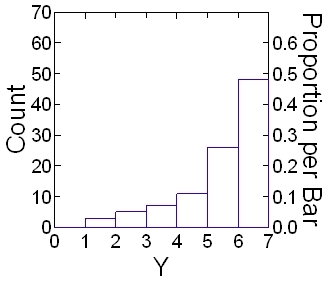 Anyway type 1 error is the type you are always seeing associated with p=.05. It is the probability of being wrong if you reject the null hypothesis. That is, if you say that red fish are bigger than blue fish, based on your samples of each, you could see this much difference in size between them just by chance. 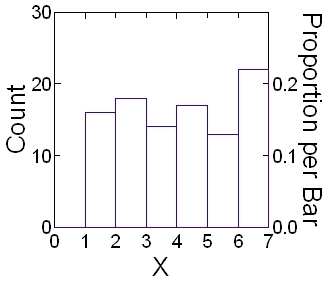 You roll a single die several times and get the following distributions – these are the number of times you rolled each number. This is NOT what you expect. All those 6’s? nearly 50% 6’s? Now, of course it is possible that someone would roll a die 100 times and get a 6 47 times. But how likely??? That is the question that p-values answer. In the olden days, when I was young, you had to calculate this crap by hand, or look it up in a table that never ever made sense. But now, with the advent of modern society, decafe coffee, no smoking in restaurants, it is possible to have it computed for you. That is the p-value. What is the probability of seeing this by chance? p=0.05 tells you how much chance. Or 1 in 20 times you would see this much difference by chance. And yes, sie is stealing your data (p = 0.00000012 in the above case). This entry was posted in animals, math, stats, Uncategorized and tagged antlers, p-value, type-1 error, type-2 error by Potnia Theron. Bookmark the permalink. Reading this post and my attempts at teaching Chi square to my Genetics students lets me know that my semester of Statistics in college still leaves me woefully unprepared. I should teach myself some statistics this summer. Any good books you would recommend? will do a post on this… I am on a bit of a hiatus right now, but hope to resume blogging in a week or so.